We put the go in granola. Inspired by your favorite CLIF BAR flavors, CLIF Energy Granola is a delicious new way to kick-start your morning. Made with hearty clusters of organic oats, almonds, cashews, seeds, and dried fruit, it’s crafted to deliver sustained energy for adventures big and small. With the introduction of CLIF Energy Granola, CLIF enters a new category, bringing an easy, nutritious breakfast solution to the cereal aisle. 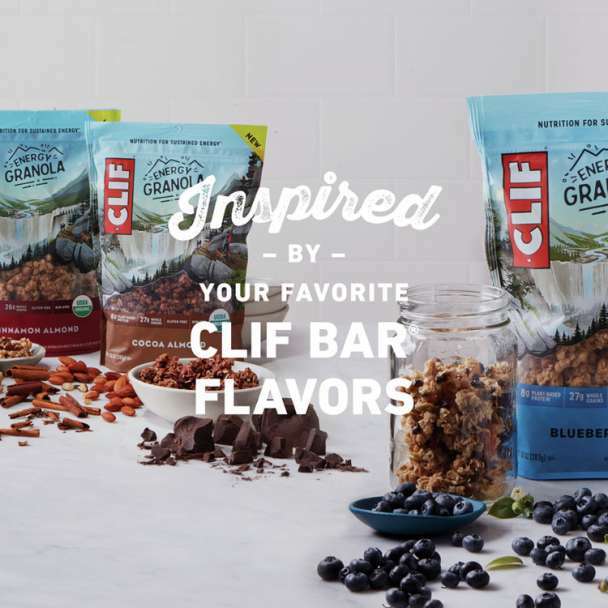 Inspired by the granola Clif Bar & Company Founder and Chief Visionary Officer Gary Erickson used to make for the hiking trips he guided through the High Sierra mountain range. Available in four tasty flavors – Blueberry Crisp, Cinnamon Almond, Cocoa Almond, and naturally flavored White Chocolate Macadamia Nut – CLIF Energy Granola is gluten free, contains 25 grams of whole grains, and the perfect complement to your morning routine. Add this certified organic treat to Greek yogurt, almond milk or homemade acai bowls for a satisfying breakfast full of flavor. MSRP: $5.49 per 10 oz pouch. CLIF® Energy Granola can be purchased at retailers nationwide or online at ClifBar.com.